There’s nothing that says “experiencing history” to me like suffering. I thought about it at Gettysburg, standing in the oppressive heat and humidity for hours waiting for the Pickett’s Charge commemoration to start. I had been thankful that I was in the latest and greatest engineered summer fabric and not covered, head to toe, in a wool uniform. And that no one was trying to kill me, although the woman behind me wouldn’t have minded if I’d dropped dead so that she could have a clearer view. It was a tough crowd. 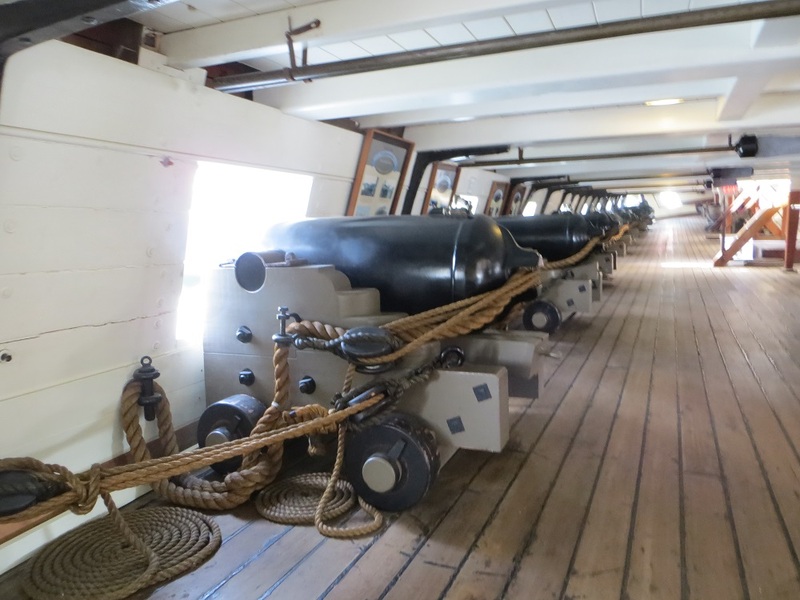 On Sunday, with temperatures in the high 90s and humidity that could drown you if you breathed in too deeply, I made the daft decision to tour the USS Constellation. The Constellation (the second naval ship of that name) was a sloop of war commissioned in 1855. Its most notable service was as the flagship for the U.S. African Squadron, when it captured 14 slave ships between 1859 and 1861, and returned almost 4000 would-be slaves to Africa. It’s now a museum ship anchored in Baltimore harbor. As I wandered below deck, trailing sweat, I wondered what it was like for the sailors, 319 of them packed in like pre-teens at a Justin Bieber concert, doing hard physical labor. The only cool place on the entire ship was in the Captain’s cabin. There was a pleasant breeze coming through his window that, I swear, wasn’t present anywhere else on the ship. There were other rooms with windows next to his, and they didn’t have a breeze. Even topside, the air was still and close. I don’t know anything about naval architecture, but there’s just something weird about that. Gallery | This entry was posted in Maryland and tagged Baltimore museum, Historic Ships of Baltimore, museum ship, USS Constellation. Bookmark the permalink. The roof looks so low on that first pic. But I tell you, I could fall into that bed in the cabin right now. Looks wonderful. (most beds look wonderful to this Sleep Monster). The ceiling on the gun deck wasn’t too low — I’d say that there was about 6 feet of space there. The lowest deck (of four) was about 4 feet, I’d say. I cracked my head on a beam down there and I’m only 5 feet tall. Hat’s off to you! During the latest heat wave, I refused to leave my air conditioned apartment until it was OVER! Always painful to imagine what it would be like to be crammed into these spaces, something I always think of when visiting sites like Plimoth, with the reconstructed 17th century houses. Entire families living in one, possibly two small rooms and a loft. At least during summer you could spend most of your time outside, but spending up to 6 months huddling next to a fireplace that let all the heat go up the chimney. Pretty much a vision of hell for me. I also notice how clean and neat this ship is! No way it looked that way when overloaded with humanity. I tell myself that they were used to being crammed into small spaces — that they didn’t have the expectation of personal space that we do. It still seems awful, though. Yes, the ship was very neat and clean. 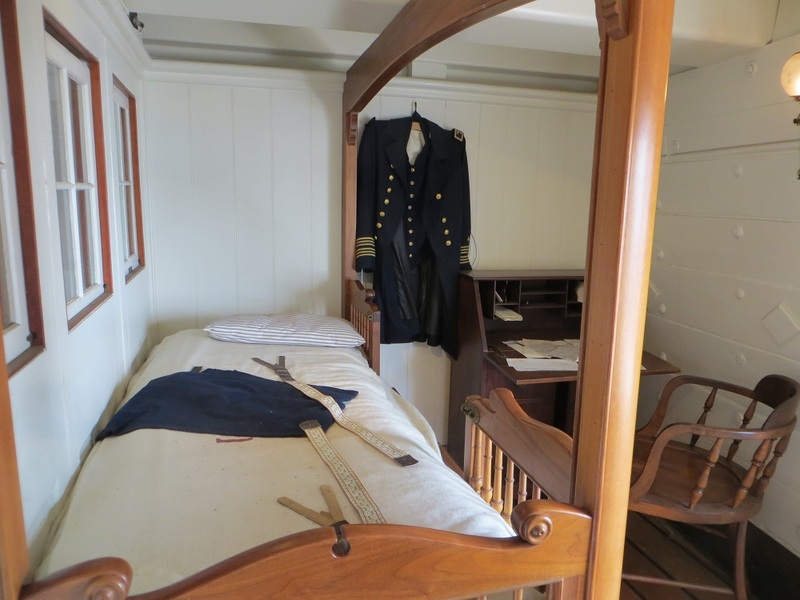 Notice that the captain has the bed guards to ensure he isn’t tossed out of bed, while the ordinary sailor had to be contented with a hammock. What a wild ride that would have been on a rolling ship! The windows above the bed – what is on the other side? Not the exterior of the ship, is it? Those windows above the bed faced into the ship. The exterior wall with the window was opposite. I thought that the captains cabin looked quite lux. Loved the rails on the bed. The hammocks looked quite cozy too, although they were pretty much shoulder to shoulder so I could see everyone smashing against each other in a wild storm. 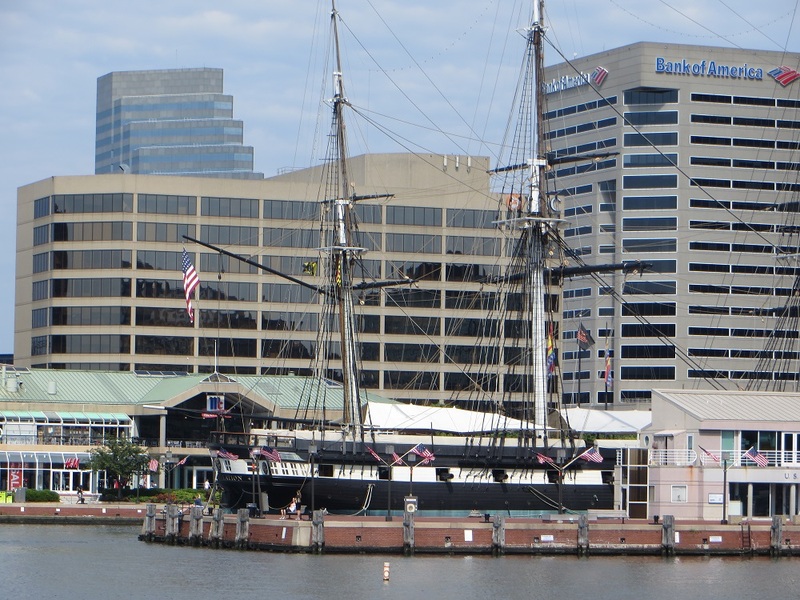 I have lived in Baltimore for more than 10 years, but I have not been on the Constellation. Thanks for the tour! I’ve lived in the area for 10 years too, and this was my first visit.